IN THE LONG RUN, WE’RE ALL DEAD. But for some of the most influential figures in history, death marked the start of a new adventure. The famous deceased have been stolen, burned, sold, pickled, frozen, stuffed, impersonated, and even filed away in a lawyer’s office. Their fingers, teeth, toes, arms, legs, skulls, hearts, lungs, and nether regions have embarked on voyages that crisscross the globe and stretch the imagination. Counterfeiters tried to steal Lincoln’s corpse. Einstein’s brain went on a cross-country road trip. And after Lord Horatio Nelson perished at Trafalgar, his sailors submerged him in brandy—which they drank. 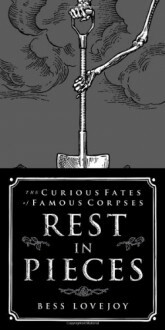 From Mozart to Hitler, Rest in Pieces connects the lives of the famous dead to the hilarious and horrifying adventures of their corpses, and traces the evolution of cultural attitudes toward death.